Simon & Schuster, 9781476739403, 528pp. The definitive history of Asian Americans by one of the nation’s preeminent scholars on the subject. An epic history of global journeys and new beginnings, this book shows how generations of Asian immigrants and their American-born descendants have made and remade Asian American life in the United States: sailors who came on the first trans-Pacific ships in the 1500s; indentured “coolies” who worked alongside African slaves in the Caribbean; and Chinese, Japanese, Filipino, Korean, and South Asian immigrants who were recruited to work in the United States only to face massive racial discrimination, Asian exclusion laws, and for Japanese Americans, incarceration during World War II. Over the past fifty years, a new Asian America has emerged out of community activism and the arrival of new immigrants and refugees. No longer a “despised minority,” Asian Americans are now held up as America’s “model minorities” in ways that reveal the complicated role that race still plays in the United States. "Sweeping . . . Lee's comprehensive history traces the experiences of myriad Asian-American communities, from Chinese laborers in 1850s California to Hmong refugees in 1980s Minnesota. . . . The Making of Asian America shares strong similarities with other broad inclusive Asian-American histories, most obviously Ronald Takaki's Strangers From a Different Shore, first published in 1989. Lee's book doesn't radically depart from its predecessors so much as provide a useful and important upgrade by broadening the scope and, at times, deepening the investigations. . . . Fascinating. . . . I suspect Erika Lee will soon join [the canon of key Asian-American histories]." "In this fascinating retelling of the American creation story, Lee uses incisive scholarship, a wide historic lens and rich detail to fill in the long missing Asian-American pieces. Starting with ancient Greece and the Age of Exploration, from enslavement to modern day challenges, Lee tracks the epic Asian-American journey to North and South Americas, East Indies to West Indies, and in doing so, she breaks new ground and inverts the master narrative." "The Making of Asian America is a path-breaking approach to Asian American history. Professor Lee will challenge and surprise most of her readers. . . . She is clearly now a distinct and important voice in a debate of growing complexity." 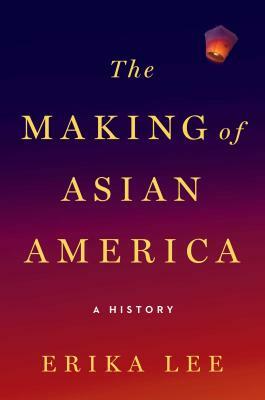 "A stunning achievement, The Making of Asian America establishes the centrality of Asians to American history, and poses alternatives to US national and immigration histories. Asians, this remarkable text reveals, transformed the face of America, and they locate the US firmly within a hemispheric and global order." "Building on the best and newest scholarship, Erika Lee has written a sweeping yet personal and critical history of Asian Americans across centuries, continents, and diverse cultures without losing sight of the global, racial, and historical contexts of Asian migration, exclusion, and resettlement. A definitive and ideal text for college classes and the general public, The Making of Asian America is truly an enjoyable, informative, and insightful read." "A well-written, panoramic view of Asian America from the colonial era to the present that sheds light on how Asian immigrants have sought to make their place in American society and, at the same time, continually changed it." "A sweeping study of the fastest growing group in the United States that underscores the shameful racist regard white Americans have long held for Asian immigrants. A historian of immigration whose ancestors hailed from China, Lee (History/Univ. of Minnesota) delineates the specific history of Asians in America—Chinese, Japanese, Korean, Hmong, and others—while also lending a general sense of what immigrants have endured: discrimination in work, wages, education, and housing, and even incarceration during World War II. . . . A powerful, timely story told with method and dignity." "Pokes holes in the 'model minority' myth by pointing out that Asians in the United States are overrepresented at both ends of the socioeconomic spectrum, and that before World War II, the group was frequently portrayed as being incompatible with American society. An impressive work that details how this diverse population has both swayed and been affected by the United States. Highly recommended for readers interested in this important topic." "Erika Lee’s new narrative of Asian American history deserves consideration to complement, if not supplant, celebrated earlier syntheses. Incorporating compelling revisionist approaches, Lee peels back several centuries of time to locate the origins of Chinese in America to the founding of the Spanish empire in America in the sixteenth century. . . . She further insists on the mainstreaming of Asian American history in the United States." "An ambitious, sweeping, and insightful survey." "The Making of Asian America chronicles the past and connects it to the present. . . . an important document of history." "Racism, as Lee shows, was the unifying factor in the Asian-American experience, bringing together twenty-three distinct immigrant groups, from very different parts of the world. . . . In the eyes of some, Asians in America are, Lee writes, 'perpetual foreigners at worst, or probationary Americans at best.' If Asians sometimes remain silent in the face of racism, and if some seem to work unusually hard in the face of this difficult history, it is not because they want to be part of a 'model minority,' but because they have often had no other choice."